Most footballers believe that a captain must have the respect of the dressing room for their actions off the pitch, a Club Website poll can reveal. 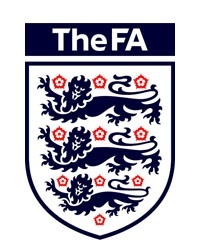 As the FA announced that John Terry has been dropped as England captain, a Club Website poll of over 3,500 users revealed that 78 percent would choose to strip a player of their captaincy if they lost the respect of the dressing room for non-footballing matters. After a week of speculation about the England captaincy following allegations about Terry's private life in the national press, England boss Fabio Capello announced his decision after a meeting with the Chelsea captain at Wembley. “After much thought, I have made the decision that it will be best for me to take the captaincy away from John Terry,” Capello said in a statement issued by the FA. Finding out what is best for your team was the reason for our Club Website poll. We wanted to test the mood of the football-playing public so we asked users how they would feel if their own captain's leadership qualities were called into question. 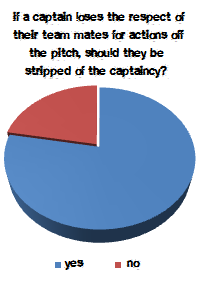 78 percent of users said that if their team's captain lost the respect of players in the dressing room for their actions off the pitch that they should be stripped of the captaincy. Whilst the majority believe that a captain must be a role model off the pitch as well as on it, others argue that off-the-pitch matters don't come into it. 22 percent of Club Website users back up this viewpoint, saying that they would keep their captain in charge even if they were to lose the respect of some players from within their squad. The debate will no doubt run all the way to this summer's World Cup but, as Terry reflects on recent events, he knows he won't be leading his country onto the field in South Africa. Instead, his centre back partner Rio Ferdinand - today promoted from his vice-captain role to take the armband - will be the man dreaming of the greatest prize for any football captain - lifting the World Cup trophy. What do you think about the results of our latest poll? There's been no bigger talking point in football this week, so get your thoughts off your chest in our comments section below. If your team's captain loses the respect of players in the dressing room for their actions off the pitch, should they be stripped of the captaincy?